After being convicted of murder, a 39-years old Filipina domestic helper was executed in Saudi Arabia. 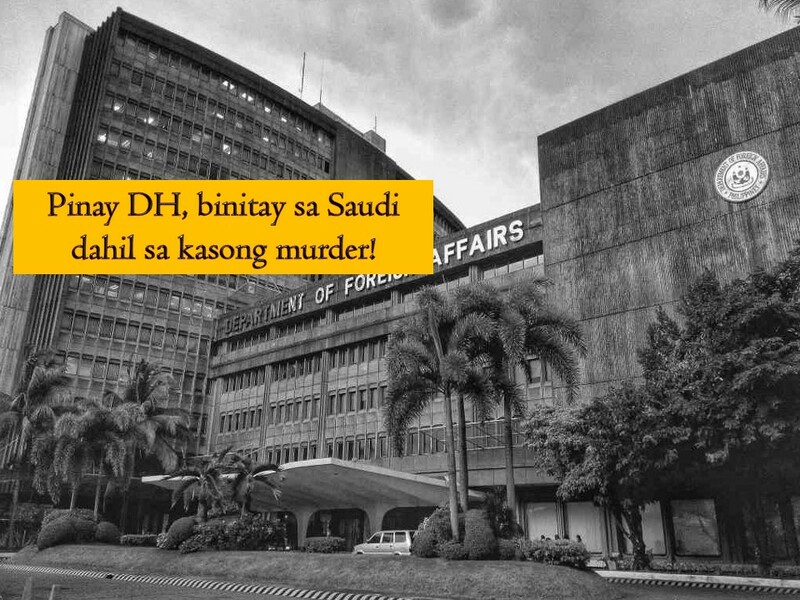 Department of Foreign Affairs (DFA) confirms the said execution of Saudi authorities against the unnamed OFW who was found guilty of murder. Earlier the Saudi Supreme Judicial Council classified the case of an OFW as one in which blood money does not apply under Shariah Law. Blood money is compensation under Shariah Law that is given to the family of murder victims. Should they accept it, the family will execute an affidavit of forgiveness so that the death penalty will not be carried out on the accused. DFA regrets that it was not able to save the life of the Filipino workers in spite of the help being provided by the Philippine embassy. It said that the Filipina was provided with a lawyer to assist her in all stages of her trial, sent a representative to visit her and gave her family in the Philippines with regular updates about her case. Also, representatives were sent to visit her while in jail in Saudi Arabia. The family of the Filipina in the country has been informed of the sad news and they request to withhold the identity of the deceased for privacy. The DFA has yet to issue information whether the remains of the executed Filipino from Saudi Arabia will be repatriated soon. The foreign affairs department also extended its condolences to the family. The execution is the second in two years after the death of Jakatia Pawa in Kuwait in January 2017.